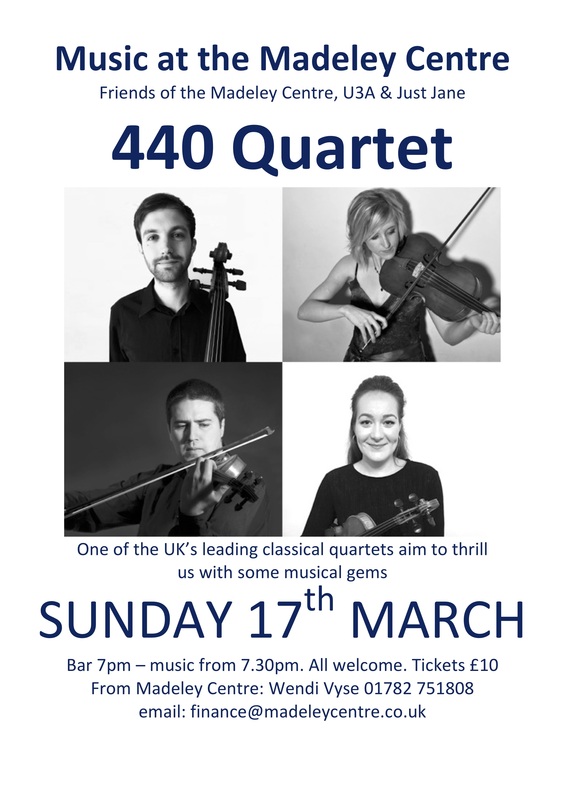 The 440 Quartet is one of the UK’s leading young String Quartets. Featuring award-winning graduates from the Birmingham Conservatoire of Music – passionate about providing the very best in live music. They were formed in 2012 and quickly established themselves as a successful ensemble, receiving lessons and taking part in master-classes from many of the country’s top chamber musicians, including Peter Cropper, Robin Ireland, Krysia Osostowicz, Oliver Wille, the Brodsky, Belcea and Maggini Quartets. As freelance players they appear regularly with City of Birmingham Symphony Orchestra, BBC National Orchestra of Wales, Royal Ballet Sinfonia and in productions for Royal Shakespeare Company, most recently Twelfth Night, Coriolanus and Macbeth. In 2014 they won the inaugural Conservatoire ‘Andrew Downes’ prize, which led to a lunchtime recital as part of the Conservatoire’s prestigious ‘Performance Platform’ series. In 2016 they collaborated with the Royal Shakespeare Company for a live BBC Radio 3 broadcast as part of the ‘Sounds of Shakespeare’ festival, performing Mozart, Beethoven, Bridge and Shostakovich. As well as public appearances, the 440 Quartet provides outstanding music for weddings and events. Regularly performing in the Midlands, Oxfordshire and The Cotswolds, but available across the UK, the musicians met in 2008 and have performed together at over 1000 weddings, recitals and events since, including as guests musicians on Fred Olsen Cruises. The programme will include a varied set of shorter pieces including the music of: Lloyd Webber, Gershwin, Beatles, Billy Joel, Mozart, Borodin and Elgar.